The Big 12’s top two scoring offenses will battle Friday night for the right to go to next week’s Big 12 championship game. There could be a rematch next week depending on how other games play out. The Sooners (10-1, 7-1 Big 12, No. 6 CFP) are chasing their third-straight title along with a berth in the College Football Playoff but might need at least one team ahead of them to lose. Oklahoma is the only team that West Virginia (8-2, 6-2, No. 13 CFP) hasn’t defeated since joining the league in 2012. The Mountaineers also haven’t gone a full season unbeaten at home since 2009. Top the Sooners on Friday night and they’ll accomplish both along with another first — playing for a Big 12 title. West Virginia’s Tony Gibson compares being a defensive coordinator in the Big 12 to “drinking water out of a fire hose.” And there will be plenty of worries with Oklahoma’s explosive offense. The Sooners have surpassed 290 rushing yards in five straight games. Murray is dangerous both as a passer (3,310 yards, 34 TDs) and a runner (739 yards, 10 TDs). Murray played the first series against the Mountaineers last year in place of Baker Mayfield. On the first play from scrimmage, Murray took off on a 66-yard run. Oklahoma’s weakness is its defense. The Sooners have allowed at least 40 points over the past three weeks. That includes 524 yards allowed last week to Kansas , which has one of the league’s worst offenses. Yet Oklahoma has won five straight since a 48-45 loss to Texas . Two of West Virginia’s last three games have been decided in the final seconds. Based on past performances in Morgantown, it might take 1,000 yards of offense to decide this game. The teams combined for 1,440 yards in 2012 when Landry Jones and Oklahoma won 50-49, 1,013 yards in 2014 in a 45-33 Sooners win, and 1,064 two years ago in Oklahoma’s 56-28 victory. The winner will clinch a berth in the Dec. 1 league championship game in Arlington, Texas. If the Sooners lose, they’ll get the second spot if No. 11 Texas loses at Kansas. West Virginia gets the second spot with a loss only if Texas loses and No. 25 Iowa State loses at home to Kansas State. Texas is in with a win over the Jayhawks. Murray was recruited to Texas A&M by Jake Spavital, who was the Aggies‘ offensive coordinator and now has the same job at West Virginia. Murray left Texas A&M after the 2015 season, which coincided with Spavital’s final year. Spavital compared the similar experiences of Murray and Grier — two transfer quarterbacks who had to wait for their chance. 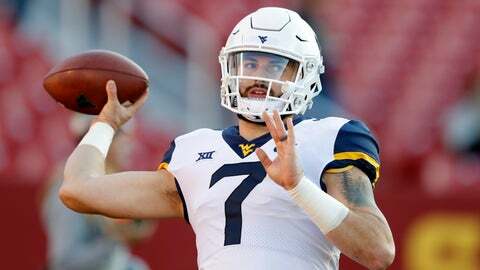 Grier transferred from Florida to West Virginia after his freshman season in 2015. Seventeen West Virginia seniors will be honored before their final home game, including Grier and wide receivers David Sills and Gary Jennings. Grier has combined for 43 touchdown passes to the pair over two seasons. West Virginia running back Kennedy McKoy has scored four touchdowns in his last two games and is coming off a season-high 148 rushing yards in a 45-41 loss at Oklahoma State. Oklahoma has allowed a league-high 25 rushing touchdowns this season.